I have no experience with dominoes other than watching them fall. However, you have 4 corners and need all the joint surface you can get. I would make these with double 1/2" thick tenons, haunched, about 3 to 3-1/2" long, and as wide as I could - 1/2" less that the net rail width, for the haunch. Your top rail would have about 92 square inches of surface area on the tenons at one end, same on the mortises - quite a bit. The lower rail will have about 50% more than that. What do the Dominoes work out to be? My purist view tells me that 'loose tenons' (misnomer applied to Domino type joinery) have twice the potential for failure. If all the gluing is perfect, then perhaps all is as well as it can be. Do the Dominoes have continuous grain from one end to the other? Or are they a composite wood product? Should be fine with the Domino XL. We use one for curved and angle joints that are otherwise time-consuming to do with tenons and dowels. 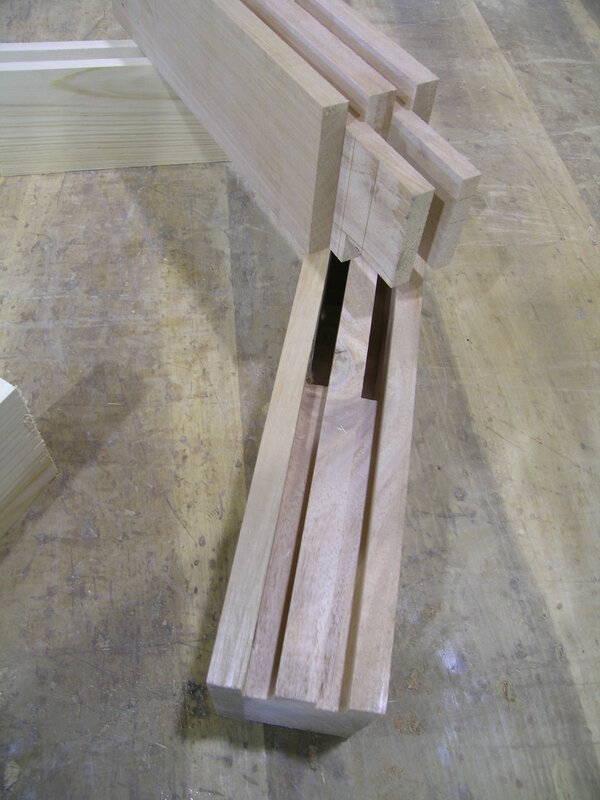 Double tenons would be the strongest but pretty expensive to set up for if you only build a few doors. If this is exterior be sure to use the Sipo tenons. You could also do a double row of 10 or 12mm thick Dominos. These are well engineered and the fit of the Dominos is very snug and unique with the waffle pattern. I recommend them for starting door builders or shops that do not make a lot of doors. Joe I feel pretty good with the domino's. But after I saw Dave's post I thought the same thing two rows would be better than just the one. These will be interior doors and will be made of poplar finger jointed stave core with poplar outer skins. Dave I agree that would be the strongest joint . I don't have the machinery to haunch out that would have to be done all by hand. I can't answer your question directly since I just don't know the materials. 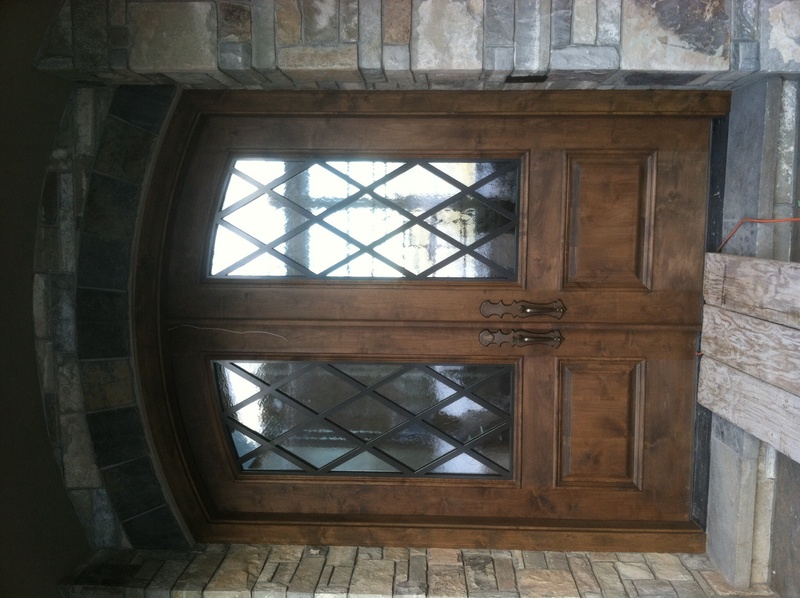 I do know that I would have no qualms at all sending a 42 x 107 door, with divided light insulated glass (much heavier than a laminated pane) out into the world with the double tenons as I described. Overkill though it may be, I have never had a joint failure. Also, the equipment I used 25 years ago to produce double tenons was a table saw, a mid-size shaper, a hollow chisel mortiser and a router. Fairly basic stuff, just used in somewhat different ways. Today, we can set up and make a double mortise and tenon in less than 15 minutes. Not as fast as I'd like, but certainly adequate for the 2-3 doors like that we do in a year. And I bet lunch (at a moderately -priced establishment) it is faster than the Domino set-up unless the machine is rigged as dedicated to that particular joint. Dave- I will give it a try I'm sure I can figure it out. It looks like there are two panel grooves on you stile and rail what is that for. Is there two panels with an air space between? That photo/joint is from a door that had a complex 4" wide bolection molding on both sides, so the grooves are to locate a mock panel ledge for the moldings to register against. They lined up nicely with the tenons and short haunches. If you have profiled stiles and rails, they can be mitered or coped. I like 1/2" thick tenons, 1/2" apart for doubles on 2-1/4" thick doors. Good practice says 1/3 the thickness should be tenon, and that would dictate 3/8" thick tenons in 2-1/4". No problems with that, I just like the 1/2". By the way, when you get this set up, make a couple of extra parts in short stock and clean them up for pass-arounds at a prospective job meeting. Nothing will convey your ability better than a well-made mortise and tenon joint. Just make sure the people handling them know to keep fingers out of the way - they can get pinched. My recommendation would be for stile width to be more like 5 1/2 to 6 1/2" wide, top rail matches. Bottom rail 10-11 1/2". Another consideration would be the door lock and hardware might have a wide plate that needs more stile width than 4 1/2" allows to accommodate the width of the hardware mounting plate. This picture shows a set of doors with 6 1/2" stiles and top rail. It might be a little wide because of the applied moulding but with the added weight of the glass and wrought iron on both inside and outside of the doors, the stiles needed to have a pretty good width to help structurally. These doors measure 41" x 113". Hope this helps.